(30) Far-out Pathways to Space: Great Guns? in the tube on top, the gun barrel is on bottom. When Jules Verne wrote in 1865 "From Earth to the Moon" he envisioned a giant vertical cannon, sunk in the ground not too far from today's Cape Canaveral. The astronauts of his novel rode inside a giant shell, which providentially missed the Moon and returned them safely to Earth. Many details in Verne's book contradict physics, and no astronaut could survive such a launch: but a cannon capable of reaching space is not impossible. The force on the shell and on any passengers inside it would be 4000 times stronger than gravity. A suitably supported person, such as an astronaut in the space shuttle, flat on his or her back, can endure accelerations of up to about 6 g. Doubling the figure can bring loss of consciousness, and any accelerations much greater than that can rupture organs and blood vessels. No, a cannon isn't a sensible way to send people into space. However, inert payloads (water, food, rocket fuel etc. ) could in principle be sent into space using a huge "super-cannon." The problem here is that a cannon shell cannot outrun the gas molecules which push it along the gunbarrel. The speed of those molecules, at any temperature, can be calculated from the laws of physics. If one then compares different gases, one find that at any temperature, the energy (1/2) mv2 of their molecules--not their velocity!--is always the same. At a given temperature, therefore, the smaller the mass m of the gas molecule, the faster it moves. The molecules produced by the smokeless gunpowder used in military cannon are far too heavy--and therefore, too slow--for sending payloads into space. The lightest and best molecule for the job, the one which (at given temperature) has the greatest velocity, is that of hydrogen. Unfortunately, no practical explosive generates hydrogen gas. 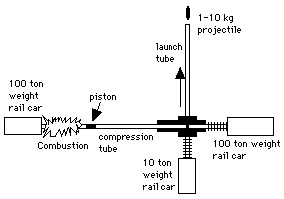 The solution is to use a gun with two connected barrels, an auxiliary barrel as well as a main one in which the payload is accelerated (see drawing). The two barrels are perpendicular to each other and are separated by a partition which shatters when the pressure on it becomes too high. Rather than a shell, the auxiliary barrel carries a heavy piston, and its volume, between the piston and the partition, is filled with compressed hydrogen. When the explosive charge on the other side of the piston is fired, the piston races down the auxiliary barrel, compressing the hydrogen ahead of it even more and heating it. At a certain point, the pressure of the hot hydrogen is sufficient to break the partition; it then flows into the main barrel and propels the payload which sits there. The payload is thus pushed not by the gases of the explosion, but by compressed hot hydrogen, whose light molecules are fast enough for the job. A cannon of this type was actually built, named SHARP--HARP, for High Altitude Research Project, was an earlier "space cannon" project (see section #30a), and S for "Super. " SHARP is used by the Livermore weapons lab near San Francisco to study the flight of space vehicles and projectiles, at up to 8-9 times the speed of sound. The explosion which pushes its piston comes not from gunpowder but from a mixture of methane and air, compressed to about 55 times the atmospheric pressure and then ignited. The piston weighs a ton, the main barrel is 155 feet (47 meters) long and the projectile emerges in a big flame of hydrogen which burns up in the atmosphere. As impressive as SHARP is, its projectiles would not get far in space, even if its barrel were not horizontal but vertical, like Jules Verne's cannon. Its velocity still falls far short of the requirement for a stable motion in space which is 24 times the speed of sound for a low-altitude circular orbit, 34 times to completely escape the Earth's gravity. John Hunter, designer of SHARP, dreams of a much larger version, embedded in a mountainside and firing payloads into space, but even with such a monster gun, problems remain. Air resistance, even at the top of the highest mountain, is still high enough to rob the payload of some of its speed, and would require a heat shield at the payload's front. Furthermore, the payload would still have to include a rocket. First of all, reaching orbital velocity (with an extra margin for air resistance!) is difficult using a cannon alone. And second, by Kepler's first law, any orbit is an ellipse with one focus at the Earth's center. If the payload is launched from point A on the Earth's surface, by necessity its orbit intersects the surface again at a symmetrically placed point B. An orbital adjustment is therefore essential. A cannon capable of lesser velocities might still be a cost-effective tool for studying the upper atmosphere, between 50 and 130 km. Scientists find it difficult to reach that altitude, which is too high for balloons but too low for satellites. Rockets have been used to reach it, but a cannon could be cheaper, as was demonstrated by the HARP project in the 1960s. Plans also exist for accelerating a payload by magnetic forces on a "rail gun" consisting of parallel conductors, into which a very large electric current is directed. The same problems apply here, plus the added one of storing and then suddenly releasing a great amount of electrical energy. That technology might be appropriate for use on the Moon, in some distant future (as Arthur Clarke has suggested in one of his stories), but it is in an even earlier stage than the space cannon. For more about electromagnetic acceleration, here is an excellent web site. Most of the weight of a liquid fuel rocket is taken by liquid oxygen--e.g. to fully burn one kilogram of hydrogen requires 8 kg of oxygen. Wouldn't it make more sense to take oxygen from the air? It would, and such motors exist, so-called "ramjets." The problem (simplified) it that before the chemical energy of an oxygen atom can be obtained, it must be brought to the speed of the rocket, which costs energy. A "scramjet" or supersonic combustion ramjet, burns the oxygen "on the fly" and may be used up to perhaps 8-9 times the speed of sound, good enough for the first stage of a rocket. But those things only work after high speed is attained, so how does one test them? "Aviation Week" (p. 40, 27 August 2001) tells how a "light gas gun" similar to the one described above helps solve that problem. In this case it is a gun of the US Air Force, with a barrel length of 120 feet (36 meters) and a caliber of 4" (10 cm). A small model of a scramjet, loaded with high-pressure ethylene fuel, was fired from it at 7.1 times the speed of sound (Mach 7.1) and its performance was photographed in flight, before it crashed into a set of steel plates at the end of the lab. Thus a gas gun helps develop spaceflight hardware, even if it is not by itself a launch instrument. "Shooting right for the stars with one gargantuan gas gun" by Richard Wolkomir, Smithsonian, January 1996, page 84. "SHARP Gun Accelerates Scramjets to Mach 9", by William B Scott, Aviation Week and Space Technology, September 9, 1996, page 63.